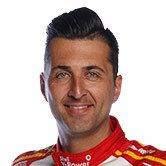 Fabian Coulthard has bounced back from yesterday’s trouble to top the morning warm-up at Sandown. The DJR Team Penske Falcon cleared Todd Kelly by 0.7042sec in the 20-minute final dash to prepare for the Wilson Security Sandown 500. Set to start 11th on the grid today, Coulthard was pleased with the Falcon in the wet during the session. Changeable conditions are forecast for today, with teams having to make a call this afternoon on car set up. “It was actually relatively easy, I was happy with the car. We haven’t driven it a hell of a lot in the rain – if we have a car like that and it rains all day we’ll have a shot,” Coulthard said. Second-placed Kelly was pleased with young co-driver Matt Campbell’s speed in the session, his first outing in the wet in a Supercar. “We planned to leave him, he’s only been driving in the dry – it wasn’t long and he was fastest, so we thought we’d better get me out!” Kelly said. “We’ve got a good wet car,” the Nissan driver said. 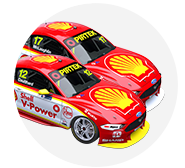 Scott McLaughlin – who starts third, finished third in the session ahead of David Reynolds and Tony D’Alberto (with Scott Pye). Drivers and co-drivers both participated in the session, with teams completing pit stop and driver change practice for the last time before the 500. The wet conditions caught rookie Cameron Waters out early, spinning on his first lap out. The Craig Lowndes/Steven Richards entry finished 12th. The 500 kicks off at 1.15pm AEST at Sandown.